Luxury developer Sunland's greatest masterpiece, Abian. Located in the exclusive residential district of Brisbane's CBD, Abian inspires significance in architectural design and apartment living. PH 4102 is the pinnacle of splendour and luxury. Spanning over 323m2, this brand new top floor residence has no limitation. Perched like an Eagle's nest above the Botanical Gardens and Brisbane River with explosive 270* uninterrupted views and the ultimate privacy. As you enter PH 4102, you are treated with an enormous sense of space. The external curvilinear design creates open spaces throughout the living, dining and outdoor areas. Flowing effortlessly from one space to the next, the increased ceiling height and floor to ceiling glass throughout further enhance the penthouse feel. For the art collectors, two galleries flow from the main entrance offering over 10 linear meters to showcase your finest pieces. The kitchen is designed with practicality and style. The highest quality in Calcutta marble bench tops, two-pac cabinetry, Miele appliances including gas and induction cook tops, inbuilt wine fridge, double integrated fridges and butlers pantry overflowing with storage options, zip tap and soft close doors and draws. The master suite epitomises penthouse living with a bespoke walk in robe and ensuite design. Glorious views of the Botanical Gardens, Brisbane River and beyond give this sensational feel from the bedroom. The His and Hers walk-in robe design offers vast amounts of hanging and cupboard space, luggage storage and jewellery shelf. The continuation of natural travertine flows from the floors of the living spaces to the ensuite encasing an art inspired vanity, built-in bath, shower and toilet with bidet. The third wing of the penthouse has a purposeful approach for either guest living quarters or an adolescent offering private bedroom suite with ensuite and media room. The gallery is lined as a Library with storage and bookshelf spanning over five meters. The fourth wing completes the penthouse. The oversized laundry with its own internal clothes line and abundance of storage. Both the 3rd and 4th bedrooms (large Office) with spacious wardrobes, the main bathroom with shower, built-in bath and toilet, an additional store room and powder room. No penthouse is complete without a four car garage. Offering one space on basement level One and three side by side on basement level Two and an additional storeroom within the secure lock up basement. Abian is a building like no other in Brisbane with an array of world class amenities. The moment you arrive at the grand foyer, you are greeted with ultimate luxury. The formal sitting room and meeting room are complimented by Abian's unique 24 hour concierge. With staff available for everything from mail delivery to dog walking and dry cleaning and apartment cleaning services. Body corporate fees (including sinking and admin fund) are only $9,000 per annum approx. The level Two health club offers 6 star gym facilities fully stocked with Technogym machines, free weights and yoga mats. Indulge in a Day Spa like arrangement with one of a kind Turkish Hammam and steam room, sauna and wellness cold plunge pool. The 20m dual lane temperature regulated pool and spa facilities are perfect for relaxation and fitness. A location that has everything on its doorstep. From your very own backyard in the botanical gardens with running and walking tracks, some of Brisbane's finest dining options with the renown Eagle Street Pier precinct, Queen Street Mall and future shopping and retail in the highly anticipated Queens Wharf development. On those break away weekend, easy access to the Gold Coast via M1 (55 mins), less than 2 hours to Noosa and under 15 mins to Brisbane International Airport via Clem 7 tunnel. 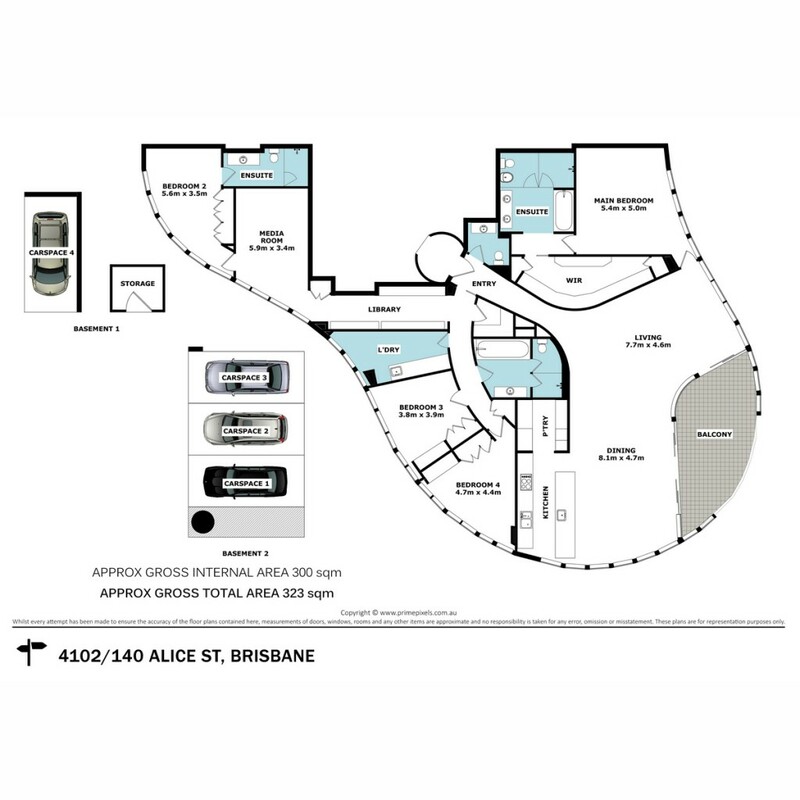 This truly is a once in a lifetime opportunity to secure one of Brisbane's best penthouses. Expression of Interest closes by 5pm Monday 22nd January 2018.